What’s Wrong With Justin Rose? I’ve rated Justin Rose as a top five golfer in the world since 2013, but his awful start to the season has dropped him to 11th in my ratings – the lowest level since his re-emergence as a star in 2012. Rose has missed the cut in three of his four PGA Tour starts in 2015, only staying to play the weekend at the no-cut WGC event at Doral where he was a non-factor and finished 55th. He’s always relied on a combination of great iron play and one of the pre-eminent short games in the world to contend, hitting it close to generate birdies and scrambling really well when he missed the green. Putting has always been circumspect (normally at or below PGA Tour average in Strokes Gained Putting), but the rest of his game has been so good it hasn’t mattered. Well, this season it hasn’t worked. Rose would rank 178th on the Tour in scoring average if he had enough rounds to qualify, and instead of the top five Tee to Green game he’s had the past three years, he’s fallen to PGA Tour average. Looking at his stats, it’s easy to identify the main culprit in his collapse this year. His Strokes Gained Putting is just completely awful; he’s losing over a stroke per round with the putter – similar to what you would expect from Boo Weekley or Lucas Glover. His misses have mainly been focused on the short putts (4 to 12 feet), so that’s where he should be making adjustments. I’ve made the case the putting is subject to extreme fluctuations in small samples (Rose has only 9 rounds tracked this season), so it’s likely that his putting will rebound to his career levels in the coming tournaments. That’s not a significant concern in my mind. What is concerning is the state of the rest of his game. 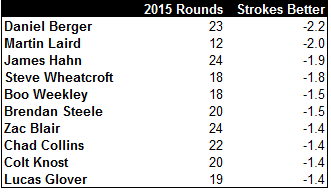 I’ve charted his results across a wide range of shot types between 2014 and 2015 below. Adj. Dist measures his driving distance on all holes relative to the field. Rel. Accuracy measures how much more accurate he’s hitting his drives than the field; +20% is Jim Furyk level elite and -20% is Andrew Loupe level wild. Other Drives measures the number of par 4/5 tee shots that end up in water/out-of-bounds/trees/desert/etc. Hit Greens measures how many more greens he’s hitting relative to the average Tour pro on his par 4 2nd shots. The rest are measuring strokes gained relative to the field on each shot type. Rose’s decline has been spread across a number of shots. His SG on drives has declined, his SG on short game shots has fallen from elite to awful, and he’s lost a ton of ground on par 4 approach shots. In other words, his strengths last year (short game and par 4 approach shots) have turned into weaknesses. Now is the time to state again that this is only 9 rounds. In fact, right before this stretch of misery, Rose played back-to-back tournaments in the Middle East and finished T12 and T13. However, this is a guy who has missed six cuts in three years; this is as close to panic as it’s likely to get for Rose. One interesting thing that pops out of his numbers is that Rose is hitting more greens with his 2nd shots than last year, but he’s not hitting anything close to the hole to generate birdie looks. That’s not good with the Masters looming; at Augusta simply bailing out and hitting the greens won’t be enough. If Rose isn’t able to hit his spots with his irons, he’ll be facing a bunch of long, slippery chances and likely racking up the three putts. That’s just the way it is on those huge, undulating greens. I’m very interested to see how he’s playing in Houston this week after two weeks off to reassess his game. Ignore his putting results and how many greens he’s hitting; focus instead on how often he’s able to get it inside 20 feet and set-up birdie. The Tour shifted to TPC San Antonio in 2010, hoping a more modern track would be a more competitive venue than the previous birdie-fest at the La Cantera resort course. Unfortunately, the course is widely panned among Tour pros – who consider it too long and difficult. They are certainly correct that it’s difficult (73.5 stroke average since 2011 on a par of 72); pros have only hit 55% of fairways and 56% of greens here since 2011. TPC San Antonio also has a lot of what the Tour calls “native area” (brush, desert, etc. – pretty much where Kevin Na made his 16 from in 2011) in play. Last year, it was among the leaders in terms of courses where players ended up in the native area off the tee. I wrote in last year’s preview that the course favored the longer/inaccurate hitters over the more accurate/shorter hitters. Concentrating on everyone who had played the course from 2011-2013, golfers who hit for more distance during the tournament played better than those who hit more fairways. Looking at 2014, Steven Bowditch and Andrew Loupe both had their best finishes on the season – they’re the archetype of the very long and very inaccurate hitter on Tour. 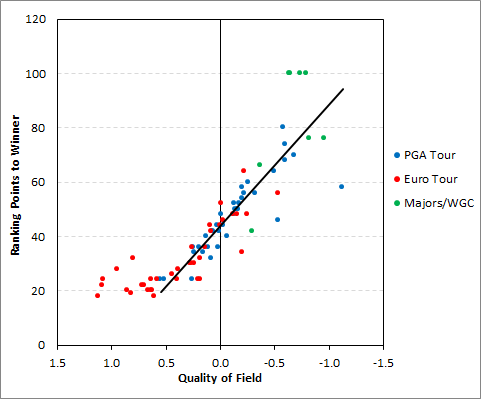 That’s not to say every long/inaccurate hitter will play well, but when I broke the field up into seven different groups based on their accuracy and distance off the tee and compared just their tee to green play from 2014, the longest/least accurate group played the best last season – even better than the group of similarly long, but more accurate pros. The important question is why the course doesn’t punish inaccuracy to the level of a normal PGA Tour course. Most importantly, the rough here just isn’t very difficult to play out of. 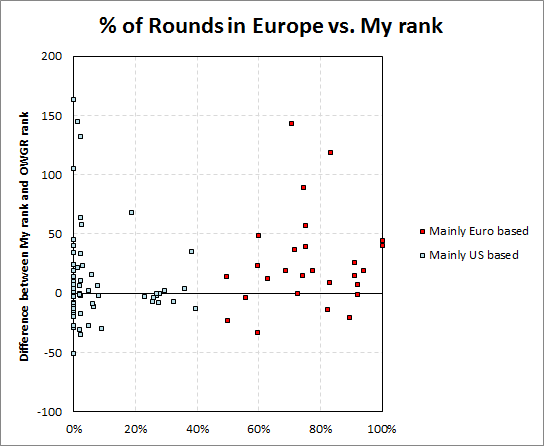 I only have shot-by-shot data for the final round in 2014, but the rough played the easiest of any course on Tour in that round (relative to the difficulty of fairway shots). What this means is that when I compare the results of shots hit from the rough to shots hit from the fairway on the same hole, shots hit from the rough only resulted in scoring 0.15 strokes worse than shots from the fairway. Normally that number is around 0.30 strokes. 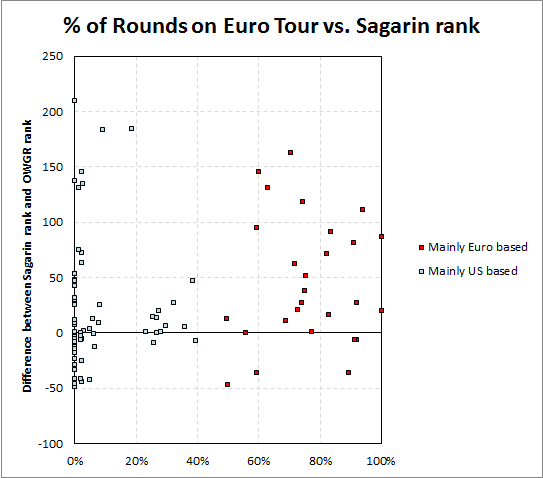 Sample size issues are a concern with only one round of data, but this measure tends to be consistent across the four rounds of an event. This is certainly an advantage for guys like Bowditch or Loupe who play from the rough more often. Distance is critical also because the par 5s are so long at TPC San Antonio, only the longest hitters have a chance to go at them in two shots. In last year’s final round, pros who normally hit their drives over 295 yards went for the green in two on 46% of their opportunities; pros who normally hit their drives under 280 yards went for the green in two on only 2% of their opportunities. Now, long hitters typically have a large advantage in going for the green chances, but normally more like 65% to 35%. Here, short hitters are basically forced into lay-ups by the length – regardless of how they would like to play the hole. That turns the par 5s (already extremely difficult) into par holes for anyone who’s not long off the tee. The focus this week has to be on the bubble boys for Masters qualification. 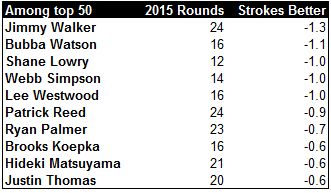 The top 50 in the OWGR after this weekend’s events earn invites to the Masters. Right now, Paul Casey is in the most precarious position – unqualified and not in this week’s event, but sitting only 49th in the world right now. Of those out of the field Marc Warren chose to enter this week’s PGA event rather than the European Tour event in Morocco. I have him projected for between 2 to 2.5 OWGR points in either location, which is basically too close to call on his chances to get in the field. Harris English has a good argument to be the best guy not invited to the Masters; he’s got an outside shot with a top ten in San Antonio. My rooting interests are the young guys playing well so far this year. Augusta will be better with one (or both) of Justin Thomas or Daniel Berger in the field. Below is the full break-down of what the guys out of the field need to do to get in this week. If you’re at all interested in tracking this/anything about the Official World Golf Rankings, follow @VC606. These are the guys who have played best here relative to their typical performances. In other words, for each year they’ve played I’m comparing their TPC San Antonio performance to their average performance for the year (minimum 2 starts here since 2010). View the full field course history at this Google Doc. Amid Rickie Fowler’s torrid summer last year – which included top five finishes in each major championship – the collective golf media was focused on Fowler’s need to win tournaments to validate his status as one of the big stars on Tour. Bring up Rickie’s name among golf fans now, and the question immediately turns to why he doesn’t win more often. These sorts of questions are nothing new. Phil Mickelson was hounded about his inability to win a major for years before he broke through at the Masters. Up to a week before McIlroy’s Open Championship win last summer there were questions about his ability to close out tournaments when he jumped into the lead. And just last week, Jordan Spieth captured his second PGA Tour win – hopefully distracting the critics who think he needs to win more often for a few months. PGA National’s been hosting this event for the past eight seasons. It’s one of the most difficult courses the Tour visits (71.4 on a par 70 layout last four years), largely because of the windy conditions and how the course restricts driving distance. About half of the par 4 or 5 tee-shots here will be lay-ups for the typical pro, which produces very long approach shots (~170 yards on par 4s). The scorecard may not look long, but all those three woods stretch it out significantly. This is Rory McIlroy’s first PGA Tour start of the season after going 2nd-1st in his Middle East swing. Rory’s won this event (2012) and lost in a playoff (2014), but also has some disappointing results (W/D, T40, T70) in past seasons. It’s important to realize that while he has played well here, it’s not necessarily a course that sets up ideally for him because of all the fairway woods/irons that players have to hit off the tee. 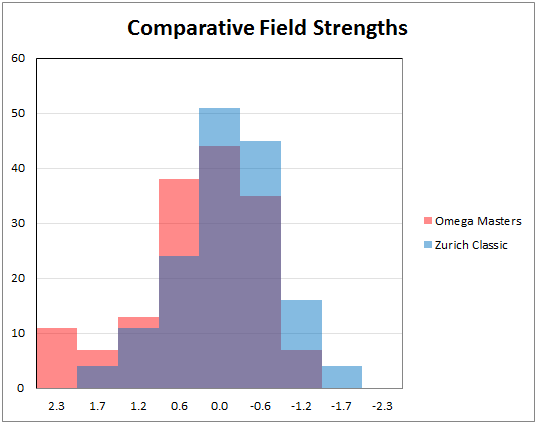 In fact, he’s actually played worse here than you would otherwise expect based on his results in all other events. In other words, his past success here is more a factor of “#1 player in the world” than anything to do with the venue. 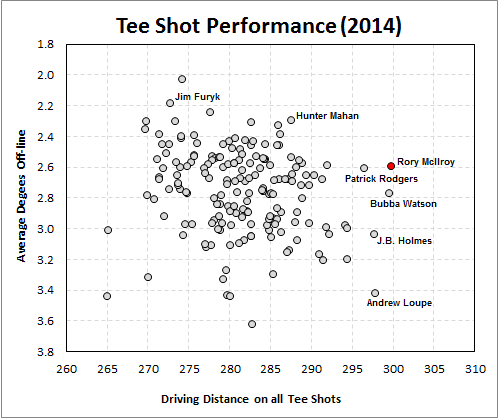 I’ve written about Rory’s combination of length and accuracy off the tee before. For comparison’s sake, I’ve attached a graph of tee shot performance from last year from everyone who I had at least 15 rounds of data for. X-axis is driving distance on all shots, adjusted for the course; Y-axis is average degrees off-line from the center of the fairway. Obviously more distance is good, and fewer degrees off-line means a player’s tee shots were more likely to be in the fairway. Rory is marked with the red dot. What is ridiculous about Rory is not only that he’s the longest player on the chart, but also that he’s ~12 yards longer than anyone who ranks as more accurate than him. In other words, he’s the platonic ideal of a bomber. Also, notice the player most similar to Rory – Patrick Rodgers. Rodgers was an outstanding collegiate golfer who turned pro last summer. He just recorded his first win on the Web.com Tour a few weeks ago, and he’s in the field at PGA National this week. The rest of his game is still very shaky, but judging by his placement on that graph the sky is the limit. The Tour has spent the last few weeks on the West Coast swing, mostly putting on poa annua or mixed greens. The Honda kicks off a stretch of four weeks putting on bermudagrass. Below is a chart of the top 15 and bottom 15 of those who putt better or worse (in terms of strokes gained putting) on bermudagrass greens relative to all other rounds (2011-14). These are the guys who have played best here relative to their typical performances. In other words, for each year they’ve played I’m comparing their PGA National performance to their average performance for the year (minimum 3 starts here since 2008). About one day before hitting the shot of his career, Phil Mickelson stood over an eagle putt on the 13th green at Augusta National. He started that 2010 third round two back of the lead and had played at one under so far, dropping to five shots behind leader Lee Westwood. He needed a strong run to finish his round and set himself up for Sunday. Of course, Mickelson rolled home the eagle putt, holed out for eagle from the fairway on the 14th hole, and birdied the par 5 15th hole (barely missing eagle) – walking off the 15th green at twelve under and leading the tournament. He would go on to win his third green jacket the next day, providing more evidence that 13-14-15 at Augusta is the most exciting stretch of holes in tournament golf. To find an objective measure of how exciting a stretch or entire course of holes is, one first has to consider what exciting means in the context of golf. In team sports, exciting stretches of the game are almost always when the game is closest and where the lead bounces back and forth. In fact, in many sports the game becomes boring if one team is playing cautiously and protecting a lead (think about a soccer team parking the bus or a football team running the ball to eat clock). Applying this idea to golf, excitement is generated by the idea that a golfer can gain or lose strokes on a hole. Which hole is more likely to hold your attention: a long par 3 where most golfers will make par or a risk/reward par 5 where anything from eagle to double bogey is in play? What creates excitement is the possibility of movement on the leaderboard, and that’s more likely on holes where anything from two under to two over is in play. The basis of my Excitement Index is just that, how likely is a golfer to gain or lose strokes on the field when they play the hole? For example, a hole where 20% of players make birdie, 60% par, and 20% bogey will result in a golfer gaining strokes on the field 28% of the time and losing strokes on the field 28% of the time [math at the end]. It turns out that 28% is slightly above average on the PGA Tour; across all holes in 2013 and 2014, golfers gained strokes on 25% and lost strokes on 25% of all holes. After calculating the Excitement Index for every hole and every course the PGA Tour visited in 2013 and 2014, it turns out that par 5 holes are slightly more exciting (~28%), while par 4s come in at around 25% and par 3s at 23%. This makes intuitive sense as par 5s have more possible outcomes in terms of eagle to double bogey, but also fewer pars than any other hole. 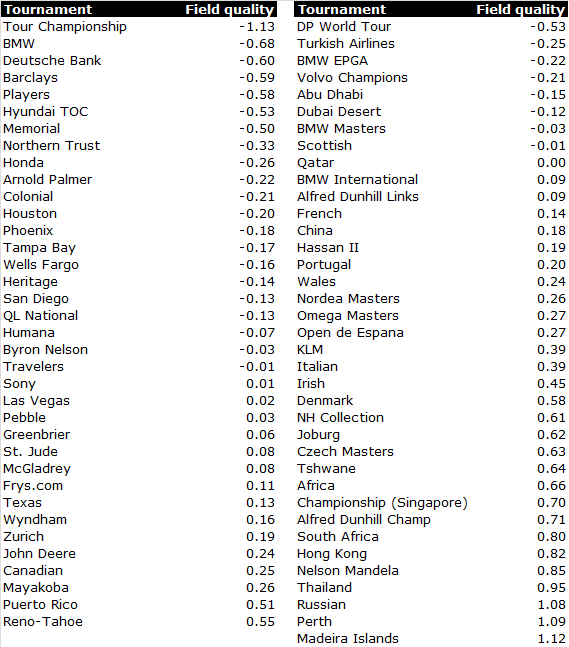 It turns out that Excitement Index has a negative correlation with the percentage of golfers who make par; making par doesn’t change the tournament like birdie or bogey does. Of courses the PGA Tour visited in both 2013 and 2014, Muirfield Village (site of the Memorial Tournament) had the highest average Excitement Index both years, closely followed by Augusta National (site of the Masters) and TPC Sawgrass (site of the Players Championship). Excitement Index is strongly correlated between seasons (R=0.76), indicating that it is measuring something very real and consistent about the course. Namely, that tournaments held at the high Excitement Index courses have more shifts on the leaderboard as golfers gain or lose strokes on the field. I’ve listed all the 2014 courses below; Ex. Index is the % chance of gaining strokes on the field on a hole. Not only does Augusta National feature the aforementioned 13-14-15 stretch, but the par 5 2nd and par 4 7th both feature in the top 50 most exciting holes on Tour (of 864 holes total). Only TPC Sawgrass also had four holes in the 50 most exciting (though not the white-knuckled 17th hole). Averaging the Excitement Index for stretches of three holes shows that the stretch of 13-14-15 at Augusta National ss the most exciting stretch on the PGA Tour. The 13th is well known as the risk/reward par 5 closing hole of Amen Corner. The 14th is a difficult par 4 which relies on a sloped green, yielding few birdies and bringing bogey in play for a lot of the field. The 15th is another risk/reward par 5 requiring a carry of the pond to reach it in two. This is the part of the course to make up ground or to fall completely out of contention. An underrated stretch in a low profile tournament is the same 13-14-15 stretch at TPC River Highlands (site of the Travelers Championship). The 13th is a par 5 with out of bounds on the left and water right on the tee shot. In 2014, the hole yielded 19 eagles, but also 18 double bogeys. The 14th is a fairly generic par 4, but the par 4 15th is drivable for the whole field, but the lake looms to catch errant shots left. The 15th also brings anything from eagle to double bogey into play. More to come on Excitement Index, including a look at the most exciting holes on Tour. [math from above]: 20% of the time a golfer makes birdie and gains on everyone who doesn’t make birdie (80%), 60% of the time a golfer makes birdie and gains on everyone who makes worse than par (20%). Multiply 20%*80% = 16% and 60%*20% = 12% and you get 28%.